“Safe” is not a word that appears in Playwright Christopher Durang’s vocabulary. If one needs proof of this, then one only needs to look to Durang’s ‘dentity Crisis and Wanda’s Visit. And conveniently for us, Theatre BSMT has packaged the two for its latest production. Presented at Motel Theatre inside the EPCOR Centre, Theatre BSMT’s double header !Duranged! is an evening of absurdist humour injected with high-energy antics. First up is ‘dentity Crisis, the evening’s more bizarre play. Coming off a recent suicide attempt, Jane (Elisa Benzer) is trapped at home with her overbearing mother, Edith Fromage (Hayley Feigs), who claims to have invented cheese. Jane’s brother Robert (Alan Johnson) offers no solace as he is not only passionately in love with their mother, but he is constantly turning into Jane’s father, her grandfather, and a French count. Jane’s only ally seems to be her psychiatrist Mr. Summers (DJ Gellatly) who helps her cope with her psychosis. Benzer does well not to play her lines for laughs, instead going for the dark, disturbed nature of her character (as she best demonstrates in her “Peter Pan” monologue). In doing so, the ensuing absurdity has somewhere to go as opposed to hitting us at 100% from the beginning , which would exhaust the audience. The escalating nature of the piece is laugh-out loud funny. The actors fully commit to the outrageous hijinks that hit one after another from beginning to end. (It gets to a point where even the sight of Gellatly’s ridiculous facial expressions draw big laughs from the audience). Unfortunately, some of that eagerness leads to some stumbling on lines. As well, the momentum of the play is interrupted by the poor build of the two doors on stage. Every entrance and exit makes the door frames wobble, giving the actors a hard time when they try to shut the door behind them. It is enough to cause a dip in the energy. Foregoing an intermission, a fun musical interlude plays while the cast disassembles and arranges the set for the evening’s second play. Wanda’s Visit tells the story of Jim (Gellatly) and Marsha (Tara Marlena Laberge), a married couple celebrating 13 years together. But when Jim’s old highschool girlfriend Wanda (Feigs) comes to visit, jealousy and temptation threaten to ruin Jim and Marsha’s marriage. Compared to ‘dentity Crisis, Wanda’s Visit is much more grounded in reality which shows in Durang’s very funny, but also genuine marital dialogue between Jim and Marsha. And the couple really stands out thanks to Laberge and Gellatly who are a great pairing. Laberge is fantastic in delivering Marsha’s sharp remarks and pent up frustration which occasionally slips out over the course of the play. Gellatly is entertaining as the bumbling husband who tries to satisfy both his wife and this mad woman who wedges herself between them. And together, they share this relaxed chemistry that is simply a joy to watch. Wanda, on the other hand, is an atrocious character whose despicable behavior as a guest grates on our nerves. And Durang leaves it that way until the very end where finally, something interesting happens. Until that point, the audience is stuck with a joke that stops being funny within the first 10 minutes. Feigs does her best with the given material, but even her performance runs a bit stale. How does !Duranged! stand as a whole package? 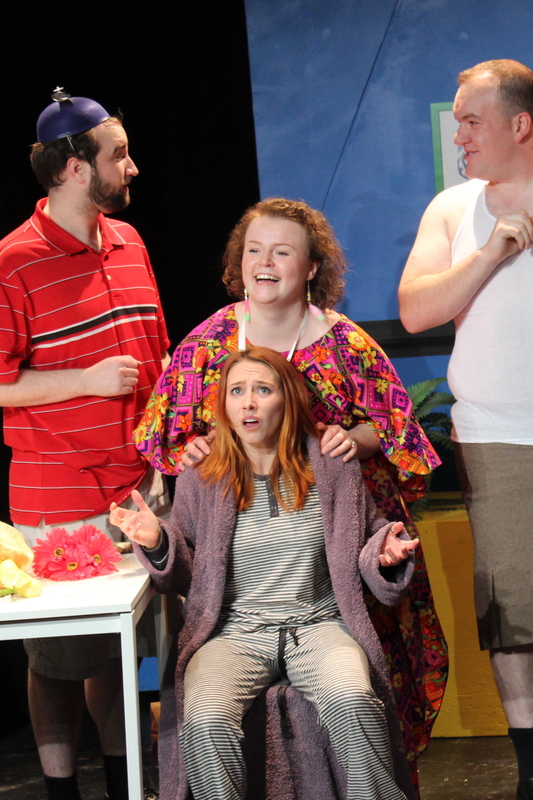 Durang’s strange sense of humour may not be for everyone, but there is something about this selection of plays that is just fun. The whole evening is a lively theatrical experience fueled by slapstick and chaos. And yes, there are issues with both the plays and the production itself, but the evening has an indescribable charm to it. Ultimately, Theatre’s BSMT !Duranged! is a curious evening of two plays that will certainly leave an impression on audiences. *This review is based off a preview performance. Theatre BSMT’s !Duranged! runs at the Motel Theatre inside the EPCOR Centre from Dec 10 – 20, 2014.